Energy consumption is on the rise globally and is a pertinent issue, especially, in a fast-developing nation like India. The total installed capacity of power generation in India stands at 310,000 megawatts (MW) as of December 2016 according to the Central Electricity Authority. The growth in overall generation stood at 5.69% in 2015–2016 and is expected to be 6.61% in 2016–2017. Similar growth rates can be expected as the real estate sector grows on the back of reforms and initiatives such as Good & Services Tax (GST), Real Estate Regulation Act (RERA) and the Real Estate Investment Trust (REIT) regulations are expected to attract institutional investors and developers and transform the sector into a more formal structure. The demand for HVAC&R systems is directly derived from the growth of the commercial and residential real estate sector, and air conditioning is one of the most energy-guzzling systems in a building. Currently, HVAC or cooling makes up 30-40% of a commercial and 10% of a residential building’s annual energy consumption. However, these percentages are expected to touch 50-60% as people become acclimatized to air-conditioning, along with the affordability of the systems. As per the ‘Make in India’ website, the Indian real estate market size is expected to touch $140 billion by 2017. Exhibit 1 shows that by 2030 the growth of total building stock in million square feet across different user segments – retail, hospitality, commercial offices, and residential, is expected to touch about 100,000 million square feet. Buildings today account for 35% of total energy consumed, and the consumption is growing at 8% annually. Construction of other infrastructure, such as development of city-side infrastructure at 13 regional airports, modernization and upgradation of non-metro airports, development of railway stations and metro stations, will spur the demand for HVAC systems. The market for HVAC systems in India is estimated to be Rs 160,000 Million (Rs 16,000 crores) in 2016. The market is expected to grow at a CAGR of 10-12% over the next five years. 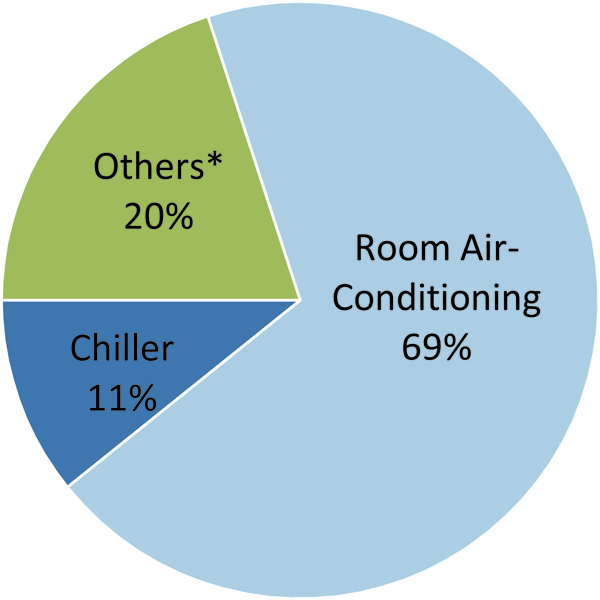 Room air conditioners, chillers, and variable refrigerant flow (VRF) are the major segments that are likely to contribute to the steady growth of the market. VRF is expected to outperform ducted/packaged units and pose a threat to scroll chillers when used in multiple modules, due to scalability of operation and efficiency factors. The growth of room air conditioners is largely driven by the affordability and rising income levels of families in India. According to National Council of Applied Economic Research (NCAER) findings, the number of middle-class households is expected to touch 113.8 million households by 2025. And, only 52% of middle-class households in India possess air conditioners, suggesting that there is a whole 48% that has not been penetrated. This bulging base of middle-class families represents an immediate opportunity to a majority of air conditioner manufacturers in India. The demand for other products such as AHUs, packaged units, chillers, and VRFs is witnessing growth in India due to the rise in construction activities and industrial expansion where cooling is a must, from both the comfort and process application points of view. *Others include ducted/packaged units, vapor absorption machines (VAM) and variable refrigerant flow (VRF) and, air handling units. The demand for office space in India was 26 million sq. ft. in 2015 and is expected to reach 28 million sq. ft. in 2016 in eight major cities (Chennai, Hyderabad, Mumbai, Kolkata, NCR, Bengaluru, Pune, and Ahmedabad) mainly due to demand from IT/ITeS, BFS, e-Commerce, telecom, healthcare companies, and start-ups. The demand for office space is expected to grow at 12-13% over the next 5 years. India has more than 300 malls, with more than 250 malls coming up in the last decade. The total stock of mall space is expected to grow to 107 million sq. ft. by 2017. Another key driver of commercial air conditioning systems are the multiplexes. India has witnessed 15% growth in terms of screen additions that reached 2,100 in 2015. At the same time, over 2,000 single screens have shut down or converted into multi-screen complexes, as single screen are burdened with higher cost of operations and falling occupancy rates. Given the size, population and low penetration of multiplexes, India can have about 7,500 to 10,000 multiplex screens. India’s infrastructure development requires approximately $1.5 trillion in investment over the next 10 years to bridge infrastructure gap. The Airports Authority of India (AAI) plans to develop city-side infrastructure at 13 regional airports across India with hotels, car parks, and other facilities, thereby boosting non-aeronautical revenue. There are about 18 to 20 metro rail projects in Vijayawada, Noida, Hyderabad, Varanasi, etc. with an investment commitment of $30 billion. Recently, proposals put up by the ministry of urban development were cleared to launch metro rail across 50 cities with an estimated cost of `5000 billion ($74 billion)1. Local manufacturing is certainly an idea whose time has come. It has been observed that prices of room ACs are going up by 3-5% year-over-year due to escalations in raw material prices. Imported units have seen much higher price escalations than companies that have local sourcing or manufacturing set up. Even in case of applied systems like chillers and VRF units, it makes business sense to have a local manufacturing unit to avoid cost escalations and to be competitive. Provision of value-added services, such as building management systems (BMS), optimizes the functioning of HVAC equipment like chillers and VRFs. According to the Indian Society of Heating, Refrigeration and Air Conditioning Engineers (ISHRAE), most commercial buildings have an Energy Performance Index (EPI) of 200 to 400 kWh/sq. m. per year. The Bureau of Energy Efficiency (BEE) has proposed an ambitious target through its voluntary Energy Conservation Building Code (ECBC) that 75% of new commercial buildings connected to 100kW or having contract demand of 120 KVA and above, need to meet minimum energy standards. It has been proposed that 20% of the existing commercial buildings reduce their energy consumption through retrofits. The implementation of ECBC could reduce the energy consumption in buildings by 25-40%. BMS is one of the solutions that can help achieve savings by reducing energy costs. In the case of Room ACs, there is utmost emphasis on companies to expand their dealer and distribution network to smaller towns and cities. Currently, semi-urban and rural areas contribute to up to 20% of the overall market, thus, there is a lot of market to be covered in addition to major cities. Likewise, in the case of applied systems, companies need to strengthen their service network to provide timely after sales support. This will also help in capturing the third-party services market for AMC of chillers. It is very important for HVAC manufacturers/companies to devise a long-term business strategy in India, given the changing market scenario. Gathering information on customer’s existing and emerging needs, preferences, and behavior that affects purchase decisions and satisfaction should be high on the agenda. It will help identify areas of disconnect with the customers and create best practices by adjusting internal processes to comply with the company’s value proposition. Companies must also embark on an exercise to assess the growth opportunities, which could form the building blocks of a competitive strategy. This analysis will also help understand which new technology-based growth areas are best suited for exploitation by your company. The bottom line is that the Indian HVAC market has abundant opportunities, provided companies can profitably build a value proposition that would cultivate customer loyalty over time.